Issue 5 of 2018, aka OCT18 is out! It includes a host of O excitement from the summer and autumn. I cant begin to describe how awesome this issue is and how you really MUST read it. Make sure your Sub is up to date! Issue 4 (aka AUG18) was posted Wednesday 10th October. As usual, we have been busy finding a lot of flags over the summer months. OCT18 & DEC18 will be out before Christmas as usual! Expect to see all the usual excitement along with coverage of EYOC, Lakes 5, 40 Years of Harvey Maps, The 40th SLMM, New O club OROX, 40th Harvester Relays, UK Club Rankings, Mapping of Combs, White Rose Sprint and more. We have oodles of coverage for all the different "World" events this summer and we will get as much of it in the OCT18 issue as possible, ie WMOC, JWOC, WOC, WTOC, WMBTOC, ARDF World Champs. Make sure your subscription is up to date! Issue 3, aka JUN18 issue, went to our printers, BMLprint.co.uk on 2nd July. It contains spectacular coverage of the British Long and Relay Championships in Scotland, European Championships Sprint Bronze Medal and Podiums and TrailO Euro Champs Relay Bronze from the British Team, Shamrock O-Ringen, BOK-OMM Partnership, Danish Extreme Marathon in Silkeborg organised by Racing Denmark, GBR Elites Abroad part 3 - who will it be? 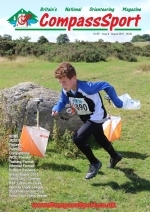 SE Sprint Champs in East London, Know Your Class Leader, CompassSport Top 120 UK Orienteer rankings, Wilf's Wonderings and all the other usual columns and competitions, and much more! Make sure you are subscribing...!